President Nicolas Maduro says the "mafia" operating in border areas is causing huge damage to the economy. Many items subsidised by Venezuela's socialist government, including diesel and petrol, are sold at a huge profit over the border in Colombia. "Let's destroy the mafia before the mafias destroy our country and our economy," he said on national television. What's behind the crisis in Venezuela? Image caption President Maduro said the measure was "inevitable and necessary"
But both sides eventually reached an agreement to cooperate on tackling crime and smuggling along the 2,200km (1,370 miles) border. 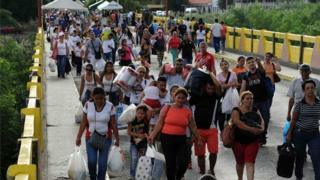 This time, Mr Maduro said the border would be reopened after 72 hours, once the 100-bolivar notes ceased to be valid. In India, a similar move scrapping high-value bank notes last month has caused major disruption. Mr Maduro said the gangs held more than 300bn bolivares worth of currency, most of it in 100-bolivar notes. President Maduro said there were "entire warehouses full of 100-bolivar notes in the [Colombian cities of] Cucuta, Cartagena, Maicao and Buaramanga". "I have given the orders to close all land, maritime and air possibilities so those bills taken out can't be returned and they're stuck with their fraud abroad," he said on Sunday. Critics of Mr Maduro have predicted chaos and doubt that the facilities will be in place for people to exchange all their 100-bolivar notes. "When ineptitude governs! Who would possibly think of doing something like this in December amid all our problems?" opposition leader Henrique Capriles wrote on Twitter (in Spanish).